Note: Not all materials in this collection have been digitized. Refer to the online finding aid on TARO for information on accessing other materials. Abstract: Jean Laffite, along with his brother Pierre, engaged in piracy and smuggling in New Orleans, Louisiana, and then Galveston Island, Texas, during the 1810s-1820s. The Jean Laffite collection has two components. One component consists of original journals, documents, photographs, and publications allegedly written or owned by Jean Laffite or other Laffite family members. These materials were in the possession of claimed Jean Laffite descendant John A. Laffite. The second component consists of documents, photographs, postcards, maps, publications, clippings, research materials, manuscripts, and artwork that were collected by former Texas Governor Price Daniel Sr. The collection pertains to Jean Laffite’s career as a pirate/privateer, his alleged post-1820s life in the United States, Laffite family history, John A. Laffite’s activities and communications concerning his alleged Laffite family materials and his sale of the materials, and Price Daniel’s purchase of and interest in the Laffite materials. Photographic formats include tintypes, cartes-de-visite, and prints. Material dates from 1773 to 1986, and undated, with the bulk dating 1845-1979. Photocopies of some material contain information that originally dates from 1608 to 1980. 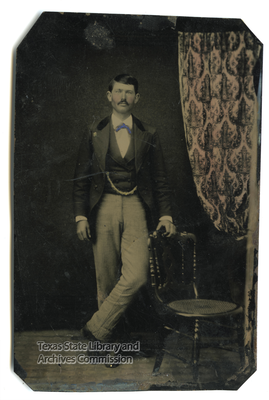 Portions of this collection have been digitized and are part of the Texas Digital Archive. Location: This collection is housed at the Sam Houston Regional Library & Research Center, P.O. Box 310, Liberty, Texas 77575, 936-336-8821. Language: These materials are written in English, French, and Spanish. A description of original records referenced in this finding aid, including those not digitized, is available at http://www.lib.utexas.edu/taro/tslac/00018/tsl-00018.html. Jean Laffite’s date and place of birth and parentage are uncertain. Some sources state that he was born in Bayonne, France, about 1780 or 1781, the son of a French father and a Spanish mother. Other sources claim that he was born on the island of Hispaniola. By 1808, he and his older brother Pierre were in Louisiana, engaging in smuggling from Barataria Bay to New Orleans. During the War of 1812, in September 1814, Britain offered Jean Laffite $30,000, a pardon, and a commission in the Royal Navy if he would help them capture New Orleans. Laffite, however, hoping to obtain a pardon for his illegal activities and the restoration of goods confiscated by the United States government, offered to fight on the side of the United States. Louisiana Governor W.C.C. Claiborne and his defense council rejected Laffite’s offer and on September 11, U.S. Navy ships attacked Barataria, destroying the pirate stronghold and its fleet. Three months later, Laffite met with General Andrew Jackson and offered him assistance, which the general accepted. Laffite supplied men, weapons, and his knowledge of the region, and during the Battle of New Orleans on January 8, 1815, his men helped Jackson’s forces overwhelmingly defeat the British. For the next two years Jean Laffite tried unsuccessfully through legal avenues to regain property and ships that had been seized by the United States in the attack on Barataria, traveling to Washington, D.C., and Philadelphia to meet with President James Madison. In 1817 the Laffites moved their smuggling and privateering operations to Galveston Island, Texas. There they established the town of Campeche and recommenced their activities. In January 1818 a group of French refugees from the Napoleonic wars, led by Charles Lallemand, arrived in Galveston with plans to establish a colony (Champ d’Asile) on the Trinity River. The Laffites provided them with supplies but also reported their activities to the Spanish government. Eventually, confronted with the American government’s determination to destroy their Galveston operations, Jean Laffite and his followers set fire to Campeche and quietly departed in May 1821. What became of Jean Laffite after he left Galveston Island is not known for certain. It is believed he sailed to Mugeres Island, off the coast of Yucatán, where he continued to engage in piracy until his death in the Yucatán around 1825. In the 1950s, a journal surfaced in the possession of a man named John A. Laffite (also known as John Laflin), who claimed to be a descendant of Jean Laffite. The journal relates how, after his announced death in the 1820s, Jean Laffite returned to the United States, married and reared a family, and died in Alton, Illinois, in the 1850s. The authenticity of this journal has not been established. Jean Laffite, along with his brother Pierre, engaged in piracy and smuggling in New Orleans, Louisiana, and then Galveston Island, Texas, during the 1810s-1820s. The Jean Laffite collection has two components. One component consists of original journals, documents, photographs, and publications allegedly written or owned by Jean Laffite or other Laffite family members. These materials were in the possession of claimed Jean Laffite descendant John A. Laffite. The second component consists of documents, photographs, postcards, maps, publications, clippings, research materials, manuscripts, and artwork that were collected by former Texas Governor Price Daniel Sr. The collection pertains to Jean Laffite’s activities as a pirate/privateer, his alleged post-1820s life in the United States, Laffite family history, John A. Laffite’s activities and communications concerning his alleged Laffite family materials and his sale of the materials, and Price Daniel’s purchase of and interest in those Laffite materials. Photographic formats include cased and loose tintypes, cartes-de-visite, and prints. Material dates from 1773 to 1986, and undated, with the bulk dating 1845-1979. Photocopies of some material contain information that originally dates from 1608 to 1980.
Notable items include the journal or diary allegedly written by Jean Laffite about 1845-1850 in which he relates his life in the United States following his supposed death in the 1820s, a second journal and two notebooks dating between 1840 and 1869 containing writings allegedly by Jean Laffite and other Laffite descendants, an 1806 division charter outlining portions of spoils to be distributed among ship’s officers and crew, tintypes identified as Jean Laffite and Laffite family members and friends dating about 1840s-1890s, gouache paintings or drawings dated 1840s-1860s by Laffite descendant Lois Ann Little or other artists, and manuscripts of Jean Laffite biographies written by John A. Laffite and author Audrey Walls Lloyd. The collection also includes a portfolio of research materials and reproductions of documents used by Stanley Clisby Arthur for his 1952 biography of Jean Laffite. The original documents were loaned to Arthur by John A. Laffite and after their return were later destroyed in a fire. Laffite family members have used various spellings of their family name: Laffite, Lafitte, Laffitte. While this finding aid uses Laffite as the standard spelling in the narrative description of the collection, the spelling used by particular individuals and organizations on documents and photographs is preserved as written. To prepare this inventory, the described materials were cursorily reviewed to delineate series, to confirm the accuracy of contents lists, to provide an estimate of dates covered, and to determine record types. Under the Copyright Law of 1976 as amended in 1998, unpublished manuscripts are protected for the life of the author plus 70 years. The term of copyright for published materials varies. Researchers are responsible for complying with the Copyright Law. Jean and Pierre Laffite collection, 1936-2005 and undated, 0.5 cubic ft.
Laffite Society research collection, 1969-2005, 1 cubic ft.
Marcel Moraud collection, 1857-1975, undated, 6.5 cubic ft.
Laffite Society Organization Records & Research Files, 1976-, 6 cubic ft.
Laffite Society Papers, 1806-2016, bulk 1995-2015, 6.84 linear ft.
Reginald Wilson Papers, 1972-2012, 5 cubic ft.
Arthur, Stanley Clisby. Jean Laffite, Gentleman Rover. New Orleans: Harmanson, 1952. Davis, William C. The Pirates Laffite: The Treacherous World of the Corsairs of the Gulf. Orlando, Fla.: Harcourt, 2005. Doree, Bill. Profiles in Pillage: The Galveston Pirateers 1816-1822. N.p. : by the author, 2004. Laffite, Jean and Gene Marshall. The Memoirs of Jean Laffite: From Le Journal de Jean Laffite. Philadelphia: Xlibris, 1999. (Identify the item and cite the series), Jean Laffite collection, Sam Houston Regional Library and Research Center, Texas State Library and Archives Commission. The initial donation of this collection, consisting of materials acquired by Price Daniel Sr. from John A. Laffite, was made to the Sam Houston Regional Library and Research Center by Daniel on August 1, 1978. An addition to the collection, consisting of materials separately collected by Price Daniel Sr., was donated by Jean Baldwin Daniel on November 27, 1989.